How to Make Homemade Blueberry Butter - Easily! Making and canning your own blueberry butter is so easy. If you like blueberries, and like the smooth texture and flavor of fruit butters, like peach butter and apple butter, then you'll love blueberry butter. Here's how to make it, in 12 simple steps and completely illustrated. For jams (strawberry, blackberry, peach, raspberry, etc.) 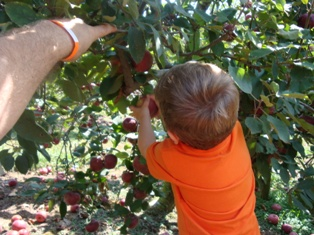 click here, and for easy applesauce or apple butter directions, click on these links. 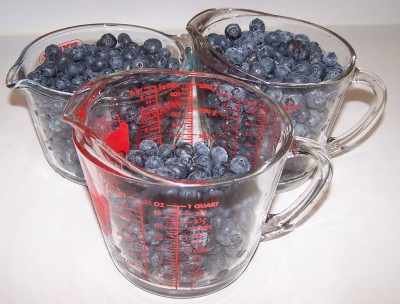 And here are simple directions to make blueberry desserts: cobbler, coffee cakes / buckles and pie! Sugar - See step 6. 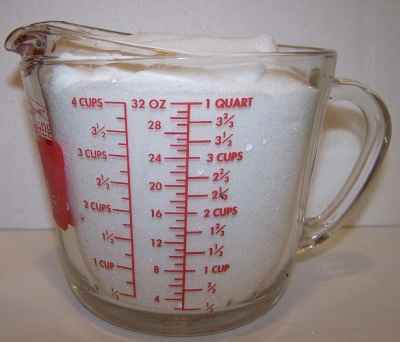 My favorite is the low sugar formula, using about 4.5 cups of dry, granulated (table) sugar. It is possible to make low-sugar, fruit juice-sweetened, or Stevia (in a prepared form like Truvia, it measures same as sugar; if you use another form, you'll need do your own conversion) - or Splenda, if you prefer, -sweetened blueberry butter; I'll point out the differences below. This example shows you how to make blueberry butter! The yield from this recipe is about 5 eight-ounce jars. As mentioned in the Ingredients section; you may use frozen blueberries (those without syrup or added sugar); which is especially useful if you want to make some butter in December to give away at Christmas! 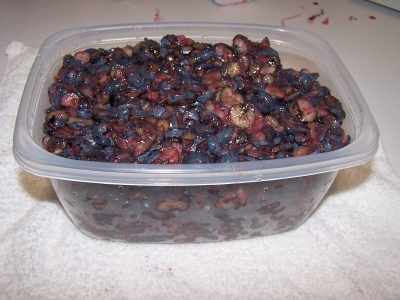 It takes about 10 cups of raw, unprepared blueberries per batch to make about 3 cups of blueberry butter. 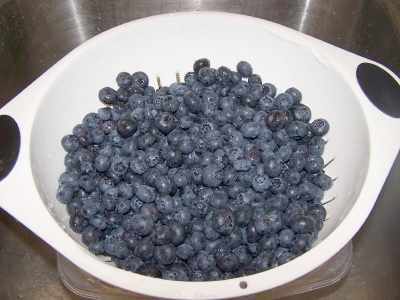 Between the air spaces in loose blueberries and the fact that it cooks down by about 1/3; the final result is half of the loose berries; for each cup of berries you start with, you'll end up with 1/2 cup of blueberry butter. Canning jars in the dishwasherNOTE: If unsanitized jars are used, the product should be processed for 10 more minutes. However, since this additional processing can result in a poor set (runny blueberry butter), it's better to sanitize the jars. Leave the jars in the dishwasher on "heated dry" until you are ready to use them. Keeping them hot will prevent the jars from breaking when you fill them with the hot blueberry butter. 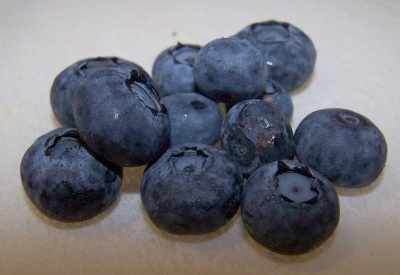 The easiest way to get a really smooth blueberry butter is to puree the blueberries in a blender before cooking them. Alternatively, a hand-held food blender in the hot cooked blueberries works, too, but the risk of being burned by splattered hot blueberry puree is there. If you don't have a blender, you can hand mash them (see photo at left), but it won't be anywhere as smooth! Either way, if you start with 10 pints of berries, you'll end up with about 6.5 cups of blueberry puree. Depending upon which type of blueberry butter you're making (sugar, no-sugar, Stevia (but you will have to experiment with amount, each brand of Stevia is a different concetration), or Splenda, or a mix of sugar and Stevia (or Splenda) or fruit juice - especially for those on sugar-restricted diets) you will need to use a different amount of sugar. You can also use honey instead! About 1 cup of honey per cup of sugar. I don't recommend using Stevia (in a prepared form like Truvia, it measures same as sugar; if you use another form, you'll need do your own conversion) - or Splenda, if you prefer, by itself - plain old sugar makes a big difference in the color and taste. Unless you're diabetic, for best results, try the low or lower sugar formula below. 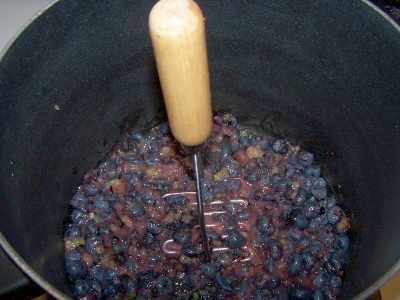 Fill the crock pot to within an inch of full with the blended blueberries. 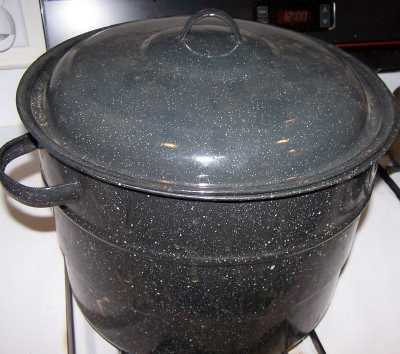 Now, you CAN do this using a regular large pot on very low heat on the stove, but the crockpot works much better, because its heat is very low. I've never had a batch burn in the crockpot. Add the sugar (about 5 cups of sugar per 10 cup batch of blueberries) and turn the heat on. I start with high, then change it to low once it gets hot and starts to boil. You can taste and add more sugar later, if you desire. 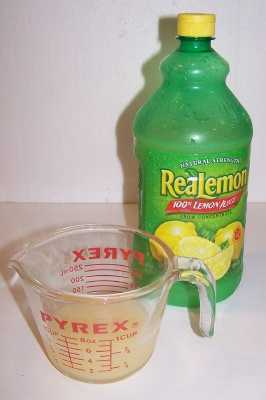 Next, add the 1/4 cup of lemon juice - it helps to act as a preservative by acidifying the butter. This is a good time to add any spices you want: Typically, people add a small amount of cinnamon and/or cloves; say 1 teaspoon of cinnamon and 1/4 teaspoon cloves. Before you leave the crockpot unattended, set the crock pot on low or medium heat. Cover it loosely or use a large pot splatter-guard. It will spatter as it boils slowly, so I also cover nearby surfaces with towels. You don't want to seal it tightly because you want the steam to escape so it can reduce in volume and thicken. A visitor suggests, take a couple of butter knives, and lay them across the top of the crock pot. They are parallel and located about 2/3 of the way out from the center. Then put the lid on these supports, leaving it "covering" the pot and keeping the splatters under control, but, leaving a good gap for steam to escape. I just made a batch and tried this approach, but I used a pair of wooden chopsticks or bamboo kebab skewers - they worked great! Leave it to cook for 6 - 12 hours. How long depends on the size and power of your crockpot, and how thick you like it, If you want to stir it occasionally, that's fine but not necessary. I let mine go overnight, set on low. When is it done? When it reaches the thickness you desire; that's all! You want a smooth, creamy texture, right? The easiest way is to use a hand-held drink blender. It does a great job of making it smooth. 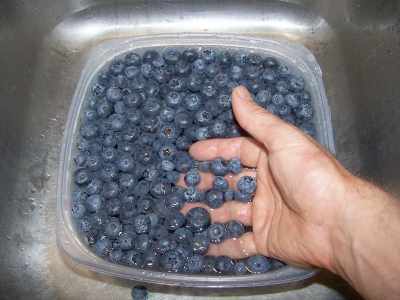 You can also put it into a regular blender, but if you are going to do that, you might want to blend the blueberries before you put it in the crock pot (it will be much thicker afterwards and won't move in a regular blender). Another visitor says running it through a food mill with a fine screen or through a sieve works, too. Too thick? if the blueberry butter cooks down too much or is too thick for your liking, just add a little bit of blueberry juice and blend it in. Not thick enough? Just let it cook some more, with the lid off so the steam can escape! Not sweet enough - add more sugar, honey or Stevia (in a prepared form like Truvia, it measures same as sugar; if you use another form, you'll need do your own conversion) - or Splenda, if you prefer, , as you prefer. 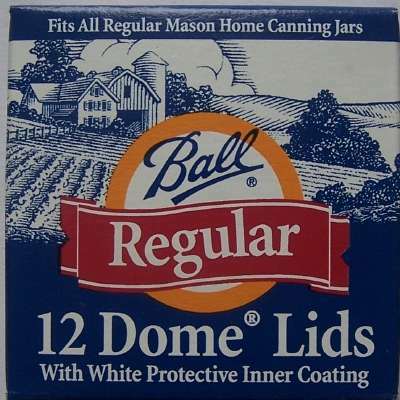 Fill them to within 1/4-inch of the top, wipe any spilled butter off the top, seat the lid and tighten the ring around them. Then put the filled jars into the canner! 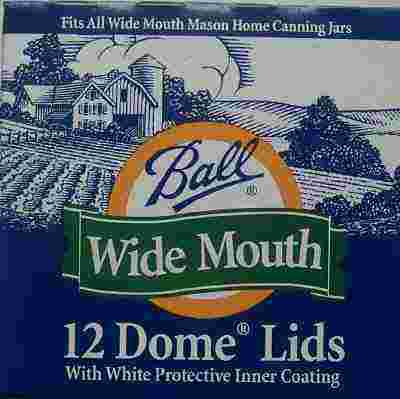 Keep the jars covered with at least 2 inches of water. Keep the water boiling. In general, boil them for 10 minutes. I say "in general" because you have to process (boil) them longer at higher altitudes than sea level, or if you use larger jars, or if you did not sanitize the jars and lids right before using them. Clemson University says you only need to process them for 5 minutes. I usually hedge my bets and start pulling them out after 8 minutes, and the last jars were probably in for 10. I rarely have a jar spoil, so it must work. Note: Some people don't even boil the jars; they just ladle it hot into hot jars, put the lids and rings on and invert them, but putting the jars in the boiling water bath REALLY helps to reduce spoilage! To me, it makes little sense to put all the working into making the butter and then not to process the jars to be sure they don't spoil! 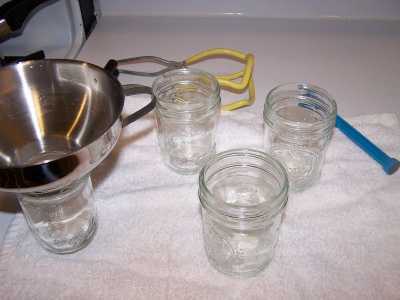 I you are at sea level (up to 1,000 ft) boil pint jars for 5 minutes and quart jars for 10 min. If you are at an altitude of 1,000 feet or more, see the chart below. 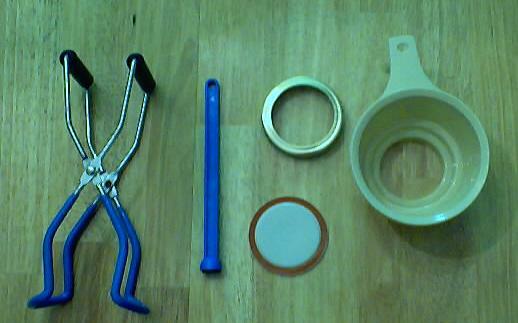 Recommended process time for Fruit Butters in a boiling-water canner. Yep! 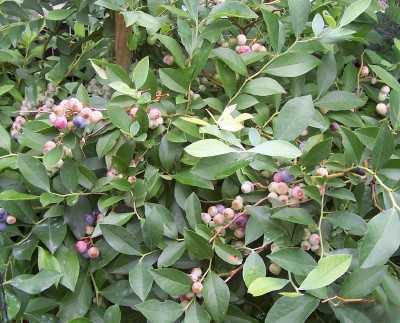 blueberries can be particularly hard to find fresh and are expensive! Frozen berries work just fine, and measure the same. Just be sure to get the loose, frozen whole fruit; not those that have been mushed up or frozen in a sugar syrup! What do I do if there's mold on my blueberry butter? Discard butters, jams and jellies with mold on them. The mold could be producing a mycotoxin (poisonous substance that can make you sick). USDA and microbiologists recommend against scooping out the mold and using the remaining jam or jelly. 1. Be sure the lid is on askew, not sealed tight, or the steam can't escape. 2. Leave the heat setting on high, during the day, when you are around and can keep an eye on it. 3. 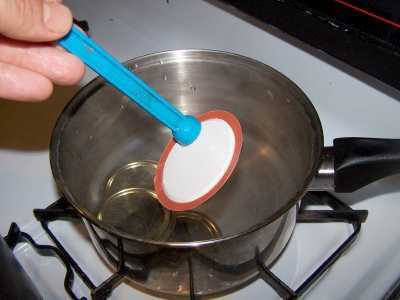 Stir occasionally to avoid burning - and to mix the thicker portions against the walls with the thinner liquid.